Texting My Pancreas: #GiveAllTheThings: Books For Parents. Roseann Milliken: You will cry, it's ok. You will be overwhelmed, it's ok. You will find a new normal. You will learn more than you ever thought possible about a disease, and push for more info. Take your time with your and your family's feelings (it is a family thing). Seek out blogs and web sites - there are others there who know how raw your emotions are and can provide hope for you and your CWD future! Please send me an email at textingmypancreas (at) gmail (dot) com with your mailing address! Products: Two books: one on parenting a child, and one on parenting a teen, with type 1 diabetes - written by author, blogger, advocate (and mother of a teen daughter with type 1) Moira McCarthy, and available to one winner! 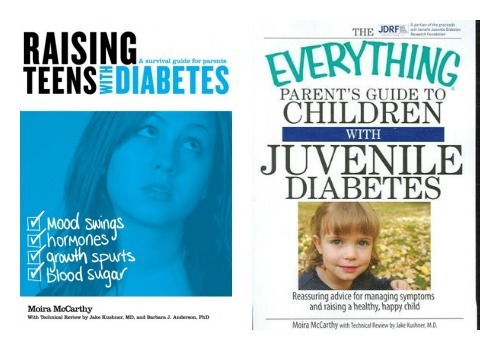 Why you want this: CWD's review: "The Everything Parent's Guide to Children with Juvenile Diabetes is a must read for parents of children newly or recently diagnosed with type 1 diabetes. Writer MoiraMcCarthy, mother of a teen daughter with type 1, uses her years of experience to help others learn what to do in many real-world situations, like sleepovers and after school sports. She touches on almost every possible subject, using terminology that is easy to understand -- even for beginners. There's something for every parent in here. Highly Recommended." And coming out in June of 2013, Teens and Diabetes: A Parent Survival Guide will be the latest edition from author, blogger and advocate Moira McCarthy. Moira will sign and send you one of the first copies available of the book. About the author, according to the author: "Moira McCarthy almost never has a clean laundry room. Her cat is the only person in her home who almost never gets annoyed at her. She's rather loud sometimes and thinks everyone should laugh at her jokes. And she totally sneaks Peppermint Jo Jos while dieting." To enter today's contest: If you could give one piece of advice either to someone recently diagnosed with diabetes, or to a parent of someone recently diagnosed, what would it be? Leave your one piece of advice in the comments below, and sign a name to it, by 8:00pm CST tonight! This post will be updated shortly after 8:00 with the name of the winner, and the contest is open to U.S. addresses only. Would love Moira's book! To the parent of a recent dx child I would say that the constant panicky feeling will subside. Make sure you have a good support network including people outside of your friends and family. It is easy to feel alone in dealing with diabetes and I have found people living with it also are often the biggest help. And DO reach out when you need it, you are not alone. Have been waiting for the Parenting a Teen book to come out - so excited to see it here. Advice to parents of newly diagnosed families. 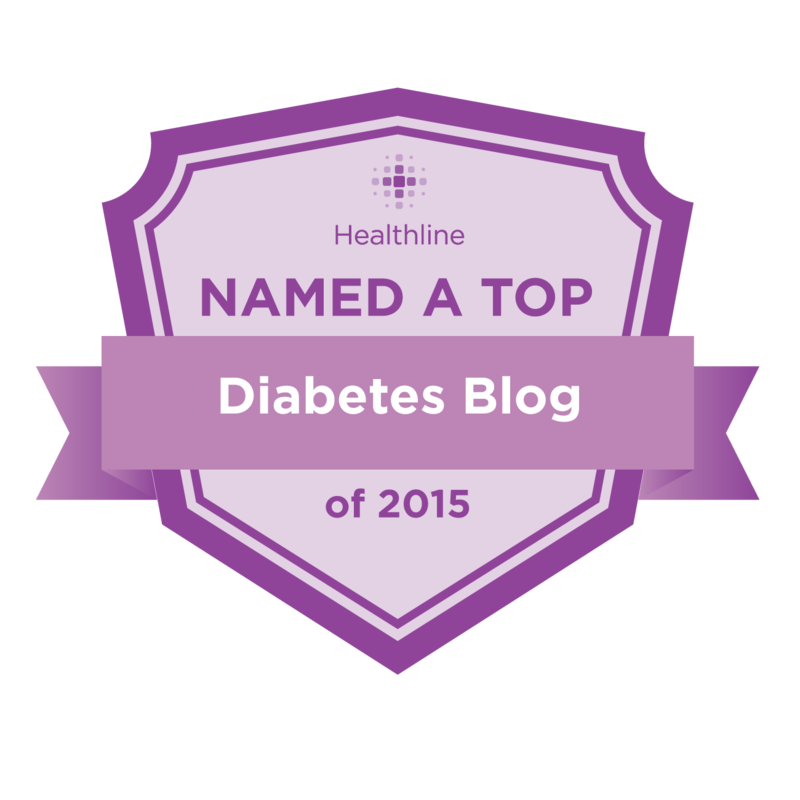 Be gracious and patient with yourself as you learn the enormous amounts of information you need and use to help your child live a normal, healthy, full life despite diabetes (Moira's blog.) Reach out to others either through the DOC or local support groups and find others who have been where you are or are exactly where you are, to support, encourage and listen. Be patient and forgive yourself the many mistakes that you are going to make. Thanks for the chance. The most important advise is a number is just a number and all can be fixed. Let your child be a child first and a child with diabetes second! I would love these books for my 13 year old son who is T1. My advise to parent of a newly diagnosed T1 child is to take a deep breath and take things 1 day at a time. We have been doing this for 2 years and no 2 days are alike! As hard as it may be just try to breath and relax, things will get better!!! My advice is to watch for trends that become patterns. 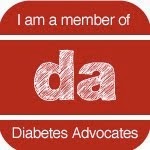 In our three years of dealing with diabetes I have learned that inconsistency is just part of the disease! Try not to let your worries and concerns control your child being able to live their life. They want to just be normal kids. My advise would be to relax - you don't have to learn it all on day one - it will come with practice. I would tell them this! You can do this! You got this! and the DOC is here anytime day or night for support! The anxiety you have over leaving your child with a babysitter or allowing her to experience playdates (without you!) and sleepovers will probably never go away. The consolation is a child that feels normal. My advice would be,first, it is not your fault, second, there are tons of resources out there and groups to help you and your child(family too)to cope, and become educated about this disease. Do not rely soley on your Edndocronologist, get out there and learn all you can because You can do this! supply it." (although I believe the knowledge and experience Moira will share in her books is worth buying if you don't win the books) and the second is not intentionally a plug for my blog - I named my blog what I did because I believe it -"Stick With It Sugar - It never gets easier, you get better". (BTW that second part about not getting easier are not my words either but despite extensive searches I cannot determine who to credit for the words) Best of luck to all - some great words of wisdom have already been shared. I cannot wait to see who wins!! My advice is always remember: this too shall pass. I wish I'd lived more in the now when Lauren was younger -- celebrating what was going well instead of worrying about the future. She's such a great adult now! If your gut tells you something listen to it!! The endo and cde have book learning, not practical experience. You will get to know your child, know what works and what doesn't. Icecream is the best nighttime snack since it has the right amount of fat, sugar and protein to keep sugars stable through the night. My advice would be not to freak out if your numbers are "out of range". So many new T1 parents see a number over 150 and panic. As your child grows and things change you will see numbers ranging from 20-500 or more. Don't panic. Just treat the lows and correct the highs. It happens to all of us. Some highs and lows are more extreme and harder to treat, but you will soon figure it out. As Moira says, "This too shall pass". My piece of advice to all parents of newly diagnosed T1 kids is to TRUST YOUR INSTINCTS. When you get "training" on diabetes you will be overwhelmed and wonder how you will ever remember it all. Well, it's just like the day your first child is born - you figure it out. You may not trust yourself at first but eventually you will know better than any doctor, nurse, dietician, and nosy lady at the grocery store. Trust your gut...you know your child best and you CAN do this! 1. You're not alone, there are many people who have been right where you are now, and more that will be there after you. 2. It never get easier, you just get better. Any mistake you make, you can guarantee others have done the same. 3. You live and learn. One piece of advice is hard to choose. But I think the big thing to remember is that you're not alone. There is a whole DOC out here to help. I wish I had known sooner. I wish someone had said, "hey when you go home, go on facebook, or online and look up these groups, they offer support." I've been T1 37 years, and now my daughter. It would have been so much easier had we known. Our local community has no support. This is hard...especially with such other great pieces of advice! Super excited for a chance to win Moira's books! My advice is, it is totally understandable how overwhelmed you are in this moment with the never ending loads of information that will be given to you in a short period of time. You are not, nor should you expect to be an expert overnight. Do not try to control diabetes because it is totally unpredictable; do your best instead to manage each number as it comes, and go from there. Reach out for help locally and in the DOC as soon as possible because having other people in your life who understand and "get" this disease is crucial and there is wonderful support out there. You CAN do this, and regardless of mistakes made and learning curves, you will make it through, even if sometimes it is getting through one minute at a time. Big hugs! My advice is plan ahead! Especially with a teen, they are going to "forget" supplies no matter how long they have been diabetic for so I always have a meter,test strips,insulin, ect... In my purse, car, the nurses office(even though my teen now carries a meter with him at all times). You will cry, it's ok. You will be overwhelmed, it's ok. You will find a new normal. You will learn more than you ever thought possible about a disease, and push for more info. Take your time with your and your family's feelings (it is a family thing). Seek out blogs and web sites - there are others there who know how raw your emotions are and can provide hope for you and your CWD future! PLEASE DO NOT PICK ME TO WIN. I do not have a CWD, but just wanted to put my 2 cents into the advice column. I have two bits of advice--first, try your best not to be overbearing and do every last D thing FOR your child. I once met a D mom that was too scared to give her kid any space at all (the boy was 8 at the time). Let them learn to help themselves, the sooner the better. My other advice for D parents is to immediately look for a diabetes camp in your area. This was one of the best things my parents ever did for me and some of my favorite memories growing up happened at camp (I went for 13 years, 4 of them as a counselor). I'd say camp has 3 major benefits--one, the kids get to meet a ton of other D kids who are "just like them". Two, it's extremely educational(though fun first, educational second!. My first year there (at 7 years old), the medical staff taught me how to draw up my own syringes. I had already been giving my own shots, but until then my parents had to fill the syringes for me. It was also at camp that I first learned over the years how to adjust insulin to my day (what I'm eating, how to plan for exercise, etc.) and where I first learned about, saw, and even got to practice wearing a pump (filled with saline, not insulin). Third, sending your kid to camp gives the parents a much-needed D break. Where else can you send your kid off for a week (or longer) and have them under the care of a professional medical staff while they have fun? This gives the parents alone time or more time to devote to their non-D kids. Everyone wins! My local camp was run by the ADA and they have others throughout the country (visit their website to find camps). There may be others if you research, but you should definitely check it out. katie this is SUCH fantastic advice. You ROCK!!! My advice is short and sweet. It is the first,most important, thing I heard out of the CDE's mouth and it is the first words I use when paying it forward. " he is a kid first and a diabetic second". Simple as that. There will be days that I will grit my teeth and let him have that treat, even though he's a little too high. There are days when I have to let him "sneak" something into his mouth as we cook(the smirk in his face while he does it is total cuteness, BTW). I will let him have the pizza even though I will pay for it later. I just will... Because he has to be a kid. Drink a margarita every week. Don't sweat the small stuff. Don't believe everything you hear. Put family first. I can't win because I live in Canada, but thought I'd offer some advise to the newly dx parent of a CWD...don't let the numbers beat you up, they are not a personal grade, they will not be where they should be all the time, just do your best and move on to the next ones. Find someone you can trust. It might not be family, and it might not be someone you expected. You will need time to yourself. Depending on the age of your newly diagnosed child, it will mean all the difference on their independence. Let them do what they want d care wise, and do the rest for them. This is a priority for your teenagers. They will have this for the rest of their lives (we can pray it is not the case), and what you can do at home while they are still under your roof is their way of getting their break from this. My advivce, take it one day at a time, and the scariness goes away and you WILL be able to go on with your life. Diabetes is a work in progress, and "mistakes" or "struggles" are lessons and add to your diabetes experience and make you STRONGER, and empower you to deal with whatever diabetes tries to throw your way. So, remember you are an ordinary person living under an extraordinary situation, imitating a working pancreas is no easy feat, ever! I'd also say, spend the money and give your teenage daughter with diabetes a Vera Bradley "pump supplies" bag this Christmas. they will want to show and tell everyone about it!